Make over your bedroom with elegant custom bedding. Fabric can define the atmosphere of your bedroom, whether you’re going for a elegant look or something more contemporary. It fits perfectly, hangs perfectly, and has the just the right amount of fluff and flair to meet your decorative style and functional needs. In addition to custom drapery, bedding, and decorative pillows, fabric can be used on high-head beds for added decorative flair. Living rooms and family rooms give you plenty of opportunities for decorative fabric design. Fabric in common living spaces ties your design themes together from room to room, emphasizing a particular pattern, style, or color palette. Examples include everything from custom top treatments above your Hunter Douglas window coverings to a simple custom-made pillow or re-upholstered chair. Decorative fabric elements for your kitchen or dining room includes custom drapery, upholstered chairs or benches, tablecloths, and decorative pillows. Add charm, style, or a burst of color when you choose from a wide variety of fabric types. Your new fabric items will tie together all your rooms and bring warmth and style to your kitchen and dining area. There’s nowhere more fun and exciting to add fabric than to nurseries and children’s rooms. From traditional teddy bears to bold new characters, fabric will bring your theme to life. Use adorable fabric choices to create custom drapery, rocking chair coverings, bedding, bumper pads, mobiles, and more. 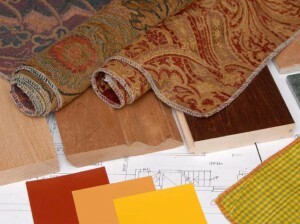 Warm color fabrics are popular, often with open, floral or geometric shapes and natural composition. From soft and beautiful natural fibers to durable and long-lasting synthetic fibers, decorative fabric items are a simple way to bring color and style to any room. We’re proud to serve the greater West Palm Beach area. Please contact us at 772-220-8870 or visit our showroom in Stuart, FL, for more information about our products and services. Contact us to learn more.